Offering you a complete choice of products which include hdpe bag printing machine - 4 colour - ws4-3054-bg, woven sack printing machine and flexographic woven sack printing machine. We are instrumental in offering our clients a comprehensive range of Flexographic Printing Machine. Flexographic Woven Sack Printing Machine are the result of experience of more than two decades. We are instrumental in offering our clients a comprehensive range of Flexographic Woven Sack Printing Machine. 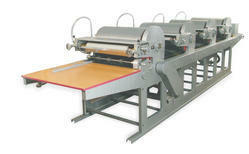 Kraft Paper Printing Machine - 2 Colour - 52" x 72"